Carol Osman-Brown, adjunct professor at Rio Salado College, is celebrating the Arizona Centennial in a unique way. 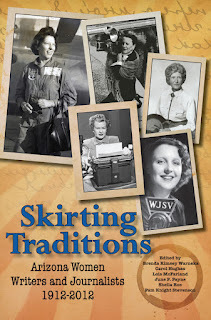 Osman-Brown has spent the last year collaborating with fellow members of Arizona Press Women, a non-profit organization made up of communications professionals, on a 308-page book titled “Skirting Traditions.” The book highlights female writers and journalists throughout Arizona’s history. “These women were ahead of their time; they paved the way for women in the press and drew attention to important social issues. In reality, they brought about a great change in our state. Sadly they are often overlooked in the history books, which is why I was eager to share their stories,” said Osman-Brown. The book, published in conjunction with Arizona’s Centennial celebration, chronicles the lives and accomplishments of 28 Arizona women. These women exhibited resilience, creativity and the grit to survive, whether on the frontier of a young state or in a male-dominated profession. Proceeds from book sales will be used to fund college scholarships for English and journalism students at Arizona colleges. The narratives in the book move from the beginning of Arizona’s statehood in 1912 forward to the modern day, describing daring feats, patriotic actions, and amazing accomplishments. Osman-Brown’s contributions consisted of her research and writings on Phyllis Leonard, who authored seven internationally published novels and Patricia Meyers, a veteran Arizona journalist and internationally renowned jazz critic. “One of my favorite aspects of writing is really getting to know what you are writing about. In my case, I feel like I really got to know these women and their great accomplishments,” said Osman-Brown. “I researched and wrote on these women because they were both very interesting and I found that I had a lot in common with them,” she added. Osman-Brown was raised in Phoenix and earned a degree in Journalism and Mass Communication from Arizona State University. Following an extensive career in the communications industry, which included work with Arizona Highways Magazine and the Phoenix Gazette, Brown now enjoys the rewarding work she does as an adjunct faculty member at Rio Salado College where she has spent the last 25 years teaching magazine writing and journalism classes to college students. “If a student dreams of being a writer, they must never give up. There are a number of opportunities out there. Just like the women in the book if you are passionate about something, learn about it and write about it,” said Osman-Brown.